Export-driven software services companies such as Infosys and Tata Consultancy Services were among the top losers, falling more than 1% each, on worries a worsening global economy could hit their earnings. Energy major Reliance Industries, which is also a big exporter of petroleum products , fell 1.2%. 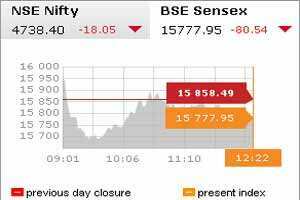 By 12:01pm, the main 30-share BSE index was down 0.37% at 15,797 with 21 of its components in the red. The 50-share NSE index fell 0.75% to 4,722 points. The benchmark had slid as much as 0.9% early before pulling into positive territory briefly. Traders said selling by foreign institutional investors (FIIs) in recent sessions, which had pushed the main index to a two-year low this week, and subdued world markets weighed on investor sentiment. “People are very skeptical if the market will be able to sustain even the present levels," Deven Choksey, chief executive at K.R. Choksey, said. FIIs have pulled out $632 million over four sessions to Wednesday, data from the market regulator showed. Shares in Pantaloon Retail (India) jumped as much as 18.2%, Shopper’s Stop rallied 15% and Trent, part of the salt-to-steel Tata Group conglomerate, rose 17.2% after India liberalised the sector raising hopes for tie-up with big global giants. The government on Thursday approved 51% foreign direct investment in the supermarket sector, paving the entry of firms such as Wal-Mart, Tesco and Carrefour into one of the world’s largest untapped markets. Property developer DLF rose as much as 6% on hopes foreign investment in multi-brand retail would bring big-ticket projects for real estate players. Shares of Phoenix Mills rose more than 11%, while Sobha Developers and Peninsula Land rose 5 and 6% each. State-run engineering firm Bharat Heavy Electricals rose 4.3% after Nomura upgraded to stock to ‘buy´ from ‘neutral´, citing incremental positive news flow starting to emerge and attractive valuations. Engineering and construction conglomerate Larsen and Toubro was up 4.1%, rising for a second day, as investors chased bargains. The stock had fallen to a more than two-and-a-half-year low on Wednesday. The 50-share NSE index was down 0.37% at 4,738.75. In the broader market, there were 2.5 gainers for every loser on volume of about 213.9 million shares. The MSCI’s measure of Asian markets other than Japan was down 1.44%. Ranbaxy Laboratories climbed as much as 4% as the launch date for its generic version of Pfizer’s $10-billion-a-year cholesterol lowering drug Lipitor nears. Lipitor’s patent expires on 30 November. Future Ventures India Ltd rose 2.3% after the firm said it had made additional investments in Clarks Future Footwear Ltd and Holii Accessories Pvt Ltd.
Jet Airways, Kingfisher Airlines and SpiceJet rose more than 5% each after the Mint newspaper reported that Prime Minister Manmohan Singh had called the heads of carriers for a meeting on Saturday to discuss ways to help the cash-strapped industry.